As a lead into reading book 3 Reached i decided that i needed the refresher from Crossed to know where the story left off and to get excited about the finale to the series. It’s funny sometimes though how if you re-read a story, you pick up on so much more than you did the first time around. The first time I read Crossed – i remember that i enjoyed it but maybe didn’t quite love it. (to be completely honest, i was a bit let down because i felt like it was predictable and kind of dragged a bit). this second time however, i found that i really enjoyed it and there was a lot that i guess i missed. So Crossed starts off when Cassia’s family is being relocated from Oria to another province for any number of reasons. It could be the honest report that the mother did on what she saw in some of the other provinces, it could be that the father (who is also an Official) was getting moved because of losing his father’s tissue sample, or it could be due to Cassia and her relationship with Ky.
Ky has also recently been taken from Oria and sent to one of the ‘outer boroughs’ where the assumption is that he’s basically going to die. The Society sends Abberations out there to act as ‘decoys’ and to make the Enemy think that there are still villagers and villages out on the outer edges of their world so that they don’t come into the provinces. The question really is – is that working? who knows….. 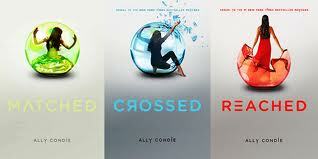 So in Crossed – Cassia is still deeply in love with Ky but is torn because of Xander, and everyone knows of her feelings. Her parents decide that the best thing for Cassia is to send her to work camps in the hopes that it’ll get her closer to Ky since that’s what she really wants…and parents always want their kids to be happy. Cassia doesn’t find Ky at any of the camps, but has an idea of where to find him and maneuvers her way out to the outer areas to get to him. Of course, there’s a price to pay since she doesn’t quite know what she’s looking for. She knows that he’s probably going to The Rising, and that he’s possibly aiming for The Carving or something out in that way, but Cassia really is going out on a whim here to figure it out. Of course, by the time she gets to the village, it’s too late – he’s gone. She’s linked up with a girl that was in the work camp (Indie) and together they make their way to the mountains, towards the Carving in the hopes that they’ll find him before they die. Or if they don’t find him, that they find something that’s better than what they have been living in the Society. Their travels takes them to land that’s demanding, and they are forced to hide, camp out, scavenge when they can, all that the same time being just a day or so being Ky (and Vick and Eli). The thing that keeps Ky going is the hope that some how he/’ll be able to go back for Cassia, and for Cassia, it’s that she keeps thinking that she’s seeing her name or markings from Ky and she feels like she’s really close. They both come across a settlement tucked inside a canyon where Ky remembers as a place that his father talked about living and that had memories for him. This was a breath of fresh air to an extent since there was food stored, and other valuables that could be used in trades if the need arose. It’s not long after this one good fortune, (coming across a settlement and Hunter who happened to be part of the Settlement and could therefore provide assistance) that Ky and Cassia’s teams cross paths. It’s great to see these 2 re-united, and the dynamic that grows among them, and with Indie, Eli and Hunter. Together, they all continue their search for aid, for The Rising, for The Pilot yet they aren’t quite sure what they are looking for or if what they are looking for even exists. It could all be just ‘lore’ or it could all be something that was created just to keep people hoping, but given Ky’s father’s background, they think that there’s something out there that’s better than what they know and therefore keep pushing forward. it’s interesting to see the bonds that are built, fostered, and killed. there’s a lot more relationship development that i picked up this time around, and a lot of the story that i guess i thought of one way when i read it the first time that was really something else. I was thinking the worst in many instances which took my attention away from the plot, when really the true story was going in another direction. So…my recommendation to you guys, if you read it 1x and aren’t wowed….give it some time and re-visit. there’s more to the story – really.